Timmins Engineering provide a full turnkey service for both agricultural steel frame buildings and steel frame buildings. Agricultural steel frame buildings and kit form steel frame buildings are some of Timmins flagship projects. Our specialism is working with steel, particularly within the agricultural sector. As with all of the steelwork, the components are all certified to BS EN 1090-2:2009 regulations, so high quality is guaranteed. With the superb in-house facilities, Timmins are able to design, engineer and fabricate your very own bespoke kit form steel frame building using our very own in-house plasma cutter. A structural steel building, fabricated to meet your individual needs and requirements. 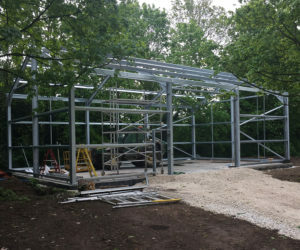 Timmins also provide a site measuring service is also offered if needed, ensuring your new kit form steel frame building will sit perfectly within the desired area. These supply-only kits can also be purchased in standard (generic) sizes, should you prefer this less customised option. Timmins have been designing and manufacturing kit form steel frame buildings for over 35 years, and the team are experienced in advising customers on the best solution for their needs. Timmins use an extensive range of durable components that are designed to last, and are also low maintenance. Your new steel frame building will be great value for money as well as being a long-term solution for your storage needs. For more information on agricultural steel frame buildings or kit form steel frames contact Timmins today. One of the more popular kits are the agricultural shed kits, as they are flat packed and ready for easy installation. For more information on building regulations for structural element see the directgov website here. Our kit form steel frame buildings will arrive flat packed, and ready for assembly on site. All ancillary items, including steel flashings and trims, cladding supplies and galvanised steel guttering will all be provided, thus allowing for easy construction. Full assembly and general arrangement documents are supplied with all kits, but Timmins Engineering also provide comprehensive client support. High levels of customer service are important and the team offer an excellent after sales service should you require any further assistance. Timmins offer fast turnaround of kit form steel frame buildings due to having a specially designed steelworks and equipment within the Lincolnshire site. Quality is never compromised though, the specialist structural steel engineers ensure all steel kits meet the full CE certification, and are CDM compliant. Timmins also offer nationwide delivery of kit form steel frame buildings, so please contact us today if you would like an estimate.